It's common knowledge that waxing your car can be beneficial not only to the life of your cars paint as well as the luster of its shine, but also helpful in the prevention of wear and tear on your automobile. Here are the top 10 signs your car could use a wax. Water doesn't bead up on the paint- no bead equals no protection; no protection equals greater possibility of damage to your car's paint. The telltale towel- After you’ve washed and dried your car fold a 100% cotton towel down to the thickness of your hand. Rotate the towel in a side to side motion while applying firm pressure. If this motion produces a squeaking sound, chances are your car is due for a waxing. Dirty already? If you just washed your car and within a few days of driving in normal conditions your car looks as dirty as ever, waxing can help with this problem. Bug Collection- If the front and grill of your car look like they could be an exhibition for bugs at the museum, a good wash and wax can help fix this. 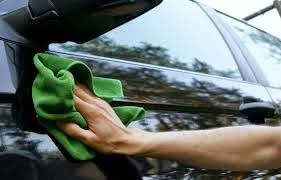 Forever washing- If after washing your car your arm feels like you wrestled an alligator, you might consider moving that alligator into the garage and waxing it. Car Scratch Fever- When after washing your car you notice that at certain points it looks like Freddy Krueger got a hold of your car, you might want to wax those scratches away. Even if the scratches don’t go away, your car is almost guaranteed to look better. Car Avoidance- If your family and friends refuse to ride with you in your car…chances are your problems are bigger than a coat of carnauba, but waxing your car might improve your chances of overcoming your social outcast status. Just a thought. That Hazy Feeling- If various spots on your car look particularly hazy either you need to see an optometrist or you didn’t wax your car properly. Read the directions on the bottle this time and wax your car again…the right way. Your Car Has a Matte Finish- Hah! Just making sure you were paying attention. DO NOT WAX A CAR THAT HAS A MATTE PAINT FINISH! This can actually ruin your paint job. Seriously, don’t wax this kind of car. We’re not kidding. Dirt and Grime Accumulation- assuming you wash your car on any regular basis an unnecessary accumulation of dirt and grime can indicate that a nice coat of wax might prevent you from having to do unnecessary labor… unless, of course, you consider waxing unnecessary labor! Come to the Olympia Auto Mall for the perfect car to wax and enjoy! With thousands of cars to choose from, the Olympia Auto Mall is the best place to shop for a new or used car in the Tacoma area.